Although it's sunny today and near 70 here in North Carolina, the calendar tells me it's winter. I'm not sure if we'll have snow this year or even weather cold enough to lend itself to winter layouts. So I thought I'd make some cold weather themed cards instead. I am crazy about the Pink Paislee Snow Day line. It's the cutest collection and looks even better in person. I recently used some of the Snow Day paper on a beach-themed layout and it worked perfectly. I considered using this paper for a Valentine with the sentiment, "you warm my heart," but then decided to use it as intended - for winter. 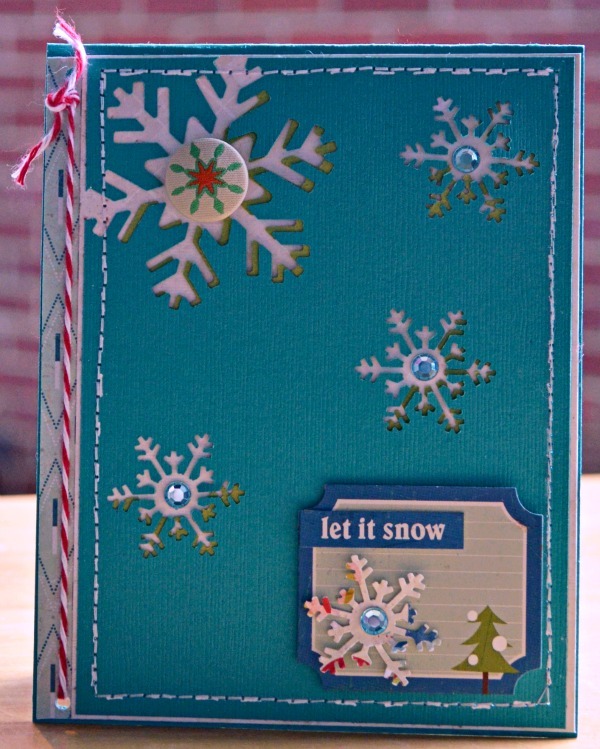 The sentiment, "warmth and winter wishes" is from a Unity Stamp Itty Bitty co-branded with My Little Shoebox. I love the Itty Bitty stamps. They're just right for card-making. The journaling block is Jillibean Soup and the chipboard mittens are Cosmo Cricket. To shape the twine into a heart, I rubbed a bit of gel glue on a length of twine and while the twine was still wet, I shaped it into a heart. It dried stiffly in just a few minutes. For my next card, I used Crate Paper's Peppermint collection. I love all the cards I've seen popping up that use the negative from a punch or die cut and I wanted to try my hand at that. I used large and small snowflake punches on teal cardstock, then cut the cardstock to make a card front, affixing it on top of cream patterned paper, and stitching in white around the edges. It's a fun and easy way to make a card. sweet cards...great idea with the twine..tfs! happy friday!!! Cute card and i love that twine heart! Beautiful cards! I loveeeeeeeeee that twine heart! oh what fantastic ways to use twine!!! Those are both beautiful!! Great job with the twine heart! Beautiful cards! Love the heart with mittens! oh, I love that! Thanks for the great how-to on the heart! Beautiful Cards!!! This reminds me of an idea I found on Pinterest, I think I'll try over the weekend. Cute cards!! 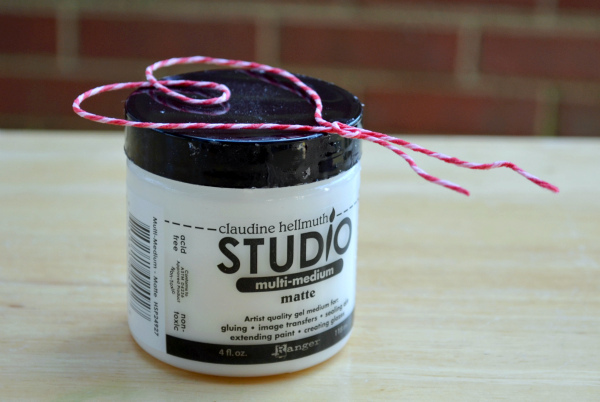 Great tip on molding the twine. Great cards and thanks for the tip on shaping the twine! I'll definitely have to try that soon! These are just as cute as can be! LOVE the twine shaped into the heart and those adorable mittens! Beautiful! I love the heart-shaped twine holding the mittens. So cute! That twine stiffening idea is great! Great cards. Lovely idea with the twine heart! 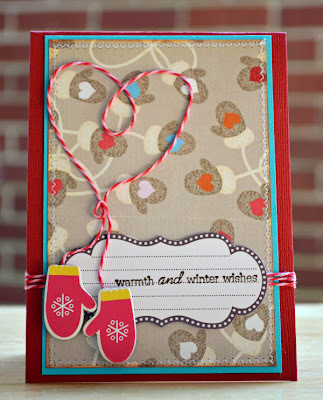 Oh cute twine heart, cute mitten card! Beautiful cards! I love how you created the heart out of twine. TFS, such a great idea...will give it a try in the future. Also, a huge welcome to the PI Design Team! I'm always inspired by your cards...and think, wow, I'm gonna go make me some cards now!! Your designs are always perfection....and thanks for sharing the twine technique! I'm definitely going to try that one! Love the mitten strings heart....adorable! Oooooooh! Awesome and amazing Winter cards, Izzy! I love them both! Your snowflake card is so cute..I admittedly have never used snowflakes... think I must give it a go sometime!